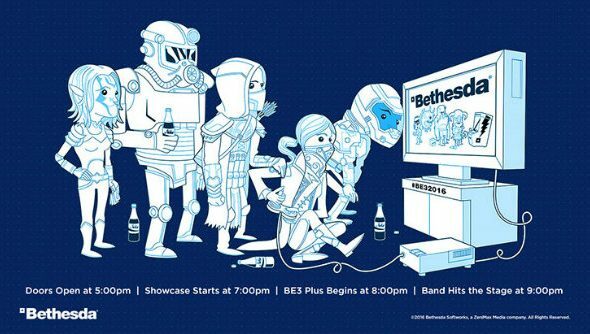 We might have already seen some publishers pull away from E3 this year, opting instead for their own show elsewhere, but Bethesda are doubling down, hosting another hour long special after their initial hour on E3’s stage. Expect this list of upcoming PC games to change after June is done. This extension – followed by a concert – suggests Bethesda have a lot to show, otherwise why bother with the expense? Last year we got lengthy demos of Doom, some The Elder Scrolls Online DLC, Fallout Shelter, Fallout 4 and the Dishonored 2 CG trailer. I think it’s safe to say Dishonored 2 is going to get the lengthy demo treatment this time, showing off the first gameplay footage and probably announcing a release date. The way Bethesda sprung Fallout 4 on us last year, I wouldn’t be surprised if there was another The Elder Scrolls thing, but I don’t think it’s likely unless it’s for TES Online. Maybe Prey 2 will resurface. Maybe there’s another Wolfenstein coming. Maybe we are finally getting the Rogue Warrior sequel we deserve. (That was a joke, please, no). I suppose we’ll find out in June. If you can get to Los Angeles on June 12, you can sign up to attend here, but be quick.